Creating awareness, providing publicity and education to promote more effective interaction with industry, to match up industriy’s needs with university’s capacities and to convey the real problems of indusry to the university so that the research outputs can be converted into products and services. Identifying appropriate funding sources, disseminating this information to the academics and providing pre-award and post-award administrative services for sponsored projects. 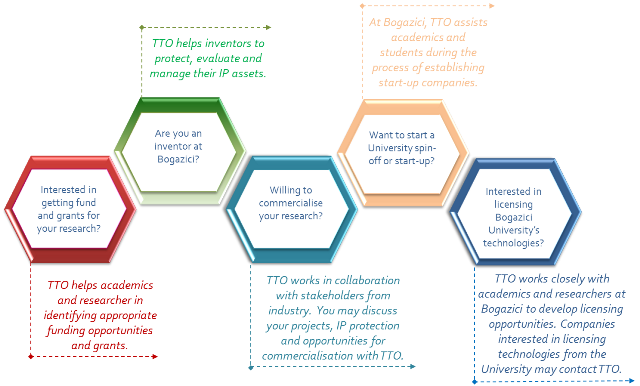 Acting as interface between university and industry by transmitting inventions and innovative knowledge from research to outside organizations for the benefit of society in a way that a wider range of users can access and exploit the knowledge and new technology. Promoting beneficial interactions between university and industry. Supporting an innovation or invention which has a compettitive edge to become a commercially valuable product, facilitating the establishment of start up and spin off companies, helping them to reach the funds.